As you’ve read in a previous post of mine (find it here), I have had times in my life where I have drifted away from Hestia. For the past 17-20 years I’ve come back to Her with a dedication I had never felt previously. My offerings are blessed; Hestia’s altar is the center of our home. 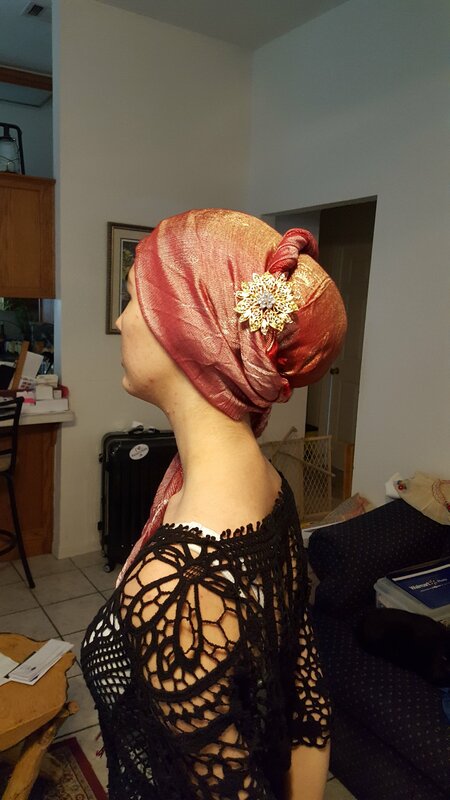 During these years I have been occasionally requested by Hestia to don the veil – or, in other words, cover my hair. At the time Her request was simple. A bandana covering the top of my head was enough. Easy enough to do as I was in employment situations where it was no problem: managing my own horse facility; working in an after-school program; retail in a dippie hippie shop. It worked beautifully, and Hestia was pleased. Lately, however, patient and gentle Hestia has been a bit more insistent in Her requests. No more bandanas outside the home. Because I had grown so close to Her in the past two decades, it was easy for Her to nudge me a little more firmly. But why cover? Unlike other assertations that it is a form of pagan one-upmanship, I must honestly confess…I rarely hang out with the masses of pagans, Wiccans, and witches. They mean nothing to me (though I’d dearly love to meet some like-minded ones); as in…..I don’t need to stand out or gain approval. I am very solitary, and strangely identify with the concept of Hestia and being “Complete in and of myself”. No, covering my hair was more of an act of greater commitment and servitude to Hestia, my Patroness of many decades. 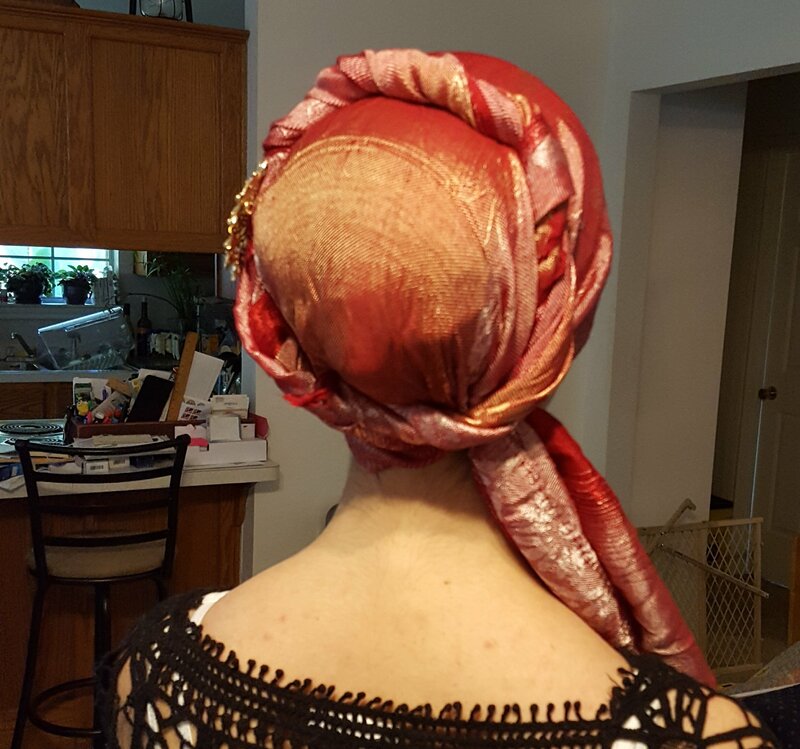 It was a difficult decision to wrangle with – covering my hair completely. I had been working a job in an exclusive boutique in a very small, elite town in very Christian Central TX. The shop owner was a bit closed-minded, but I figured he was barely ever there, so I wasn’t too concerned about that. I also discussed this with my husband, because he had never seen me in full blown hair covering….and, to be fair….it was just fair to discuss it with him (though I knew he didn’t care in the least). Before fully committing (as in…appearing in public), I did a LOT of research. A solid week was spent investigating types of wraps and….well, who else wrapped, anyway? The last thing I needed was someone condemning me for covering because it was considered “cultural appropriation”. Interestingly enough, several religious sects throughout the world integrate hair covering as part of their worldview. Most widely known are the hijabs of the Muslims, but various Christian and Jewish groups cover as well: Orthodox Christians, Mennonites, Amish, Messianic Jews, and others. The list of those who cover for religious reasons is a long one. But what of pagans? Surprisingly enough, a member of my Pagan Homesteaders list on Facebook posted her own timely blog entry on covering….in honor of Hestia, no less! Kindred spirit! We exchanged some pleasantries, and I must say I am thrilled to have found another who calls herself Hearthkeeper. My conversations with her led me to investigate more areas until I came upon a group of women on Facebook from many religious walks of life who covered their hair – and many were pagan. I’ve also been known to roll both ends and make a double crown. It’s super easy and quick, plus….stylish! I’ve had several compliments from people who have come into the store. My Hestia is pleased, and I feel more centered spiritually (plus, being empathic, it provides a bit more of a shield in certain locations; or maybe it’s just psychological). Plus….no bad hair days! 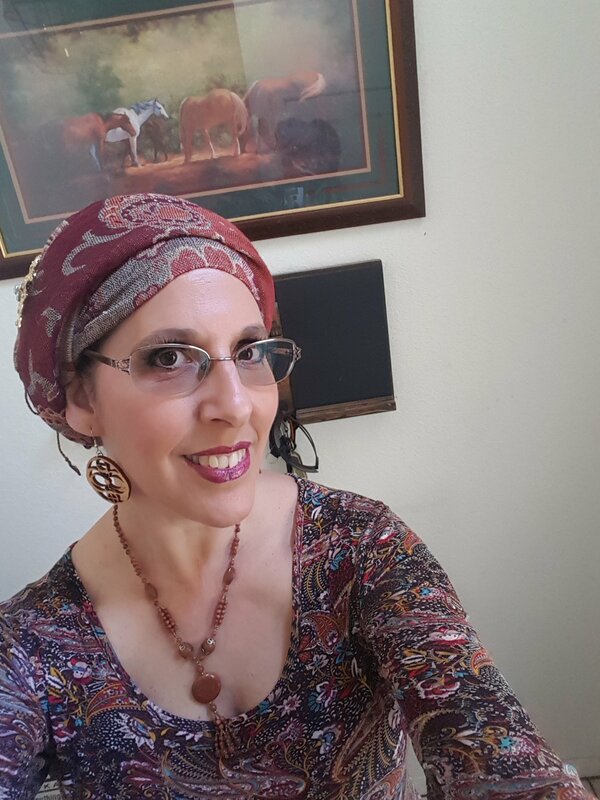 I have several headscarves (my teen daughter is an avid wrapper of hair, but not for religious reasons), but the most critical two items I have in my wardrobe come from this fabulous place called Wrapunzel. If you have long hair, their Scrunchie is perfect for keeping it all together in one place (without giving you a headache), and their Shapers are perfect for volumizing. Bonus: the velvet headbands on the shapers keeps your scarf where you want it. Plus they also have many videos to teach you an abundance of wrapping styles for All The Occasions. The biggest question I get with covering is: What do I do when I’m in the dance studio? I am a dancer, and this really is a good question. Truthfully, Hestia and I have an understanding that I am free to either cover or uncover when I am in the studio or during a performance. In my primary dance genre, my hair is mostly covered anyway, so it’s a fair compromise. My Goddess is not rigid with me in Her demands; we have had a long standing relationship and She understands how my world works. She is quite benevolent. Should you be called to cover by your deity, the only advice I can give is this: it is a choice only you can make. It isn’t a trendy choice to be different, stroke your ego or draw attention to yourself. It is a spiritual/religious obligation on your part and not something to enter into lightly. I wrestled with the decision for a month or so before covering as I wanted to be certain I could fulfill the promise I was about to make. It is a sacred pact between you and your God/Goddess. What a great post! Thanks for the link to my post and for sharing your experiences of this. 😀 It is always a joy to find another Hearthkeeper and another devotee of Hestia. Blessings! I’ll read this! Yes, it does seem to be popping up quite a bit lately and I find it interesting. In some discussion groups it’s be quite civil and enlightening. In others…its almost as if they take great offense to the question of “to cover or not” (no one’s forcing anyone to do anything. A belated welcome to the sisterhood from a devotee of Brigid! I enthusiastically second your recommendation of Wrapunzel–it’s a fantastic resource. The Facebook group “Occulta Femina” (covered women) is also quite useful, not only for wrapping ideas but for questions of practice and theology. It’s a closed group, so one has to apply, but I was accepted without any problem. You are right about it being a sacred pact, and not something to be taken up or put down lightly. If one is being called to perform this service for one’s deity, rest assured it can be wonderfully fulfilling. Every time I touch my scarf or see it in a mirror, I’m reminded of Brigid, the oaths I’ve taken, and the blessings She’s bestowed on me. Greetings and Blessings! It’s do wonderful to hear from others who have been called to service by our Patron Goddesses.